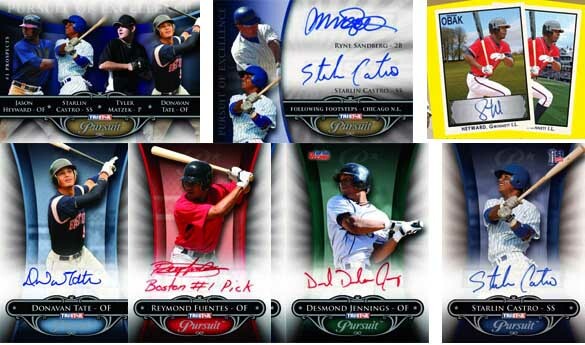 Full Name Autograph numbered to 5 or less featuring first, middle, last name! 1954 Topps Hank Aaron Rookie Card Randomly Inserted! Tristar Pursuit Series 2 is the second chapter of the "In Pursuit Of The Majors" series. Pursuit is a prospect driven product that contains an array of top tier MLB Prospects including Jason Heyward, Donovan Tate, and Dustin Ackley. Another intriguing inclusion is the random insertion of Hank Aaron Rookie Cards.